We have renders and notes for several ship models. If you have a video or film project that requires use of ship models, contact us about licensing and contracting services. a British dreadnought model in extremely high detail, based on drawings in the Anatomy of the Ship book on the class. an Austro-Hungarian dreadnought modeled in extraordinary detail. A Russian pre-dreadnought formerly named Potemkin, modeled as she appeared after being renamed following the mutiny of 1905.
this German armored cruiser, along with her sister SMS Scharnhorst, wreaked havoc in the early days of the war as part of Admiral Spee's East Indies Squadron before being sunk at the Battle of the Falklands. this American dreadnought is being modeled in part from direct measurements taken from the preserved ship herself and from her plans from the national archives. a small coastal submarine armed with 2 torpedo tubes. a German super-dreadnought that fought at Jutland. a German Kaiser class dreadnought, and sister to Friedrich der Grosse. 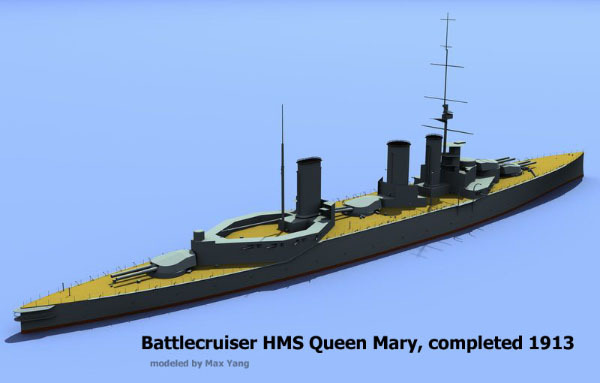 a British battlecruiser modeled using the planset included in John Robert's book, "Battlecruisers"
An Indefatigable-class battlecruiser of the Royal Australian Navy. As we model ships, we are building a growing library of the small fittings (cleats, fairleads, compasses, vents, etc) needed to make an accurate model. These fittings are placed on the website so that future ship models can employ any fittings that have already been faithfully modeled. This library also allows these fittings to be appreciated in their own right, and opens each up to close examination so that constructive criticism can help us improve the overall caliber of the work being done..